Colour Ektachrome 35mm slide depicts an abandoned mining operation.Note: Colour adjusted on JPEG. Colour Kodachrome 35mm slide depicts a view of Atlin, B.C. located on the eastern shore of Atlin Lake.Note: Brightness adjusted on JPEG. Boats resting on the shores of Atlin Lake, B.C. Colour Kodachrome 35mm slide depicts boats resting on the shores of Atlin Lake, B.C.Note: Brightness adjusted on JPEG. Colour Ektachrome 35mm slide depicts a clock on the road in Atlin, B.C.Note: Colour adjusted on JPEG. B&W print depicts Dr. Irving Snider wearing a shirt and tie and posing in front of a bush. "Dr. Irving Snider - Atlin 1935" is written on the back. 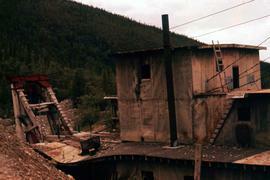 Colour Kodachrome 35mm slide depicts Discovery City, a ghost town that features a group of abandoned wooden buildings from the Klondike Gold Rush era. 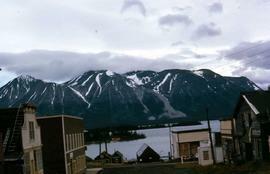 It is located in the Atlin Country Region of British Columbia.Note: Brightness adjusted on JPEG. Kootenay Hotel in Atlin, B.C. Colour Kodachrome 35mm slide depicts the Kootenay Hotel in Atlin, B.C.Note: Brightness adjusted on JPEG.